Applications to the Generator 2019 Accelerator program are now open! 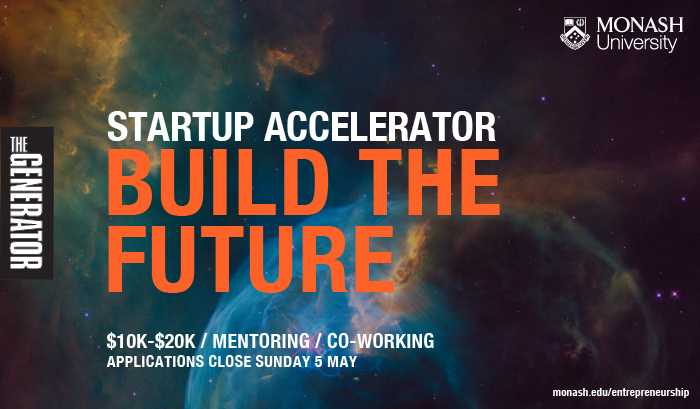 With $10k-20k equity-free seed funding to scale your startup, three months of mentoring from some of the best startup founders in Australia, and full time access to our co-working space, you’ll get what you need to take your startup to the next level. At this point you’re probably thinking “surely there's a catch”. Well the good news is there isn’t. We’re just looking for people who are crazy committed to solving real world problems through startups. With up to 12 teams being accepted into the 2019 Accelerator Program, yes it’s competitive. But if you're building something and think you’ve got what it takes, you should definitely apply. This is your chance to join the likes of Mindset, Merry People, Jarvis and Tixel in The Generator Accelerator Alumni hall of fame. What you get: $10k-20k funding, mentoring & co-working. Program dates: June 25 to September 19, 2019. Applications close: Midnight, Sunday May 5th 2019.
Who can apply? At least 10% of your startup equity has to be with a Monash staff, student or alumni.